If you ask me, the best way to revamp an outfit is by adding a little flair, aka statement accessories. 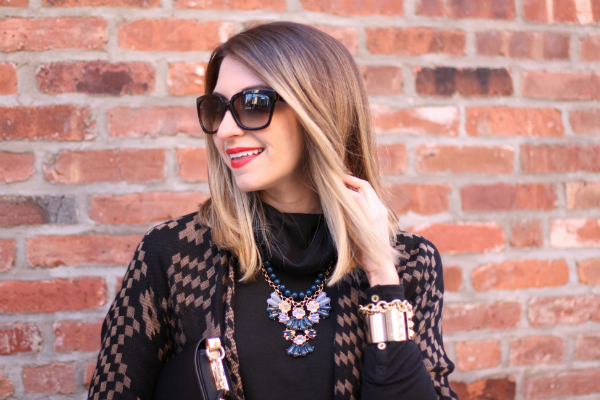 My jewelry closet is filled to the brim with statement pieces, so naturally when I laid eyes on this fun piece from Pop of Chic I couldn't wait to style it. Minimalist dressing goes out the window during the winter. It's the one time of year where we have the excuse to layer on comfy knits. More is more! 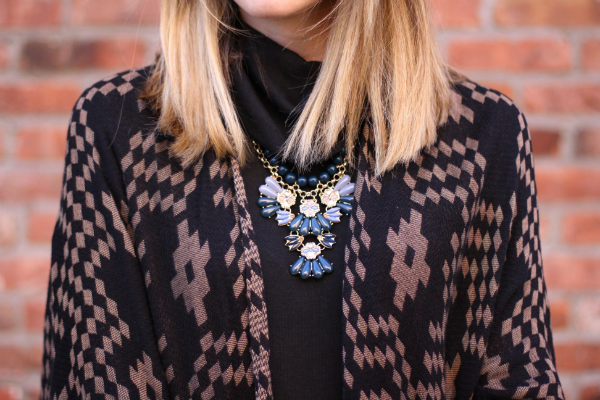 1- Don't be afraid to mix a bold pattern with a statement necklace. 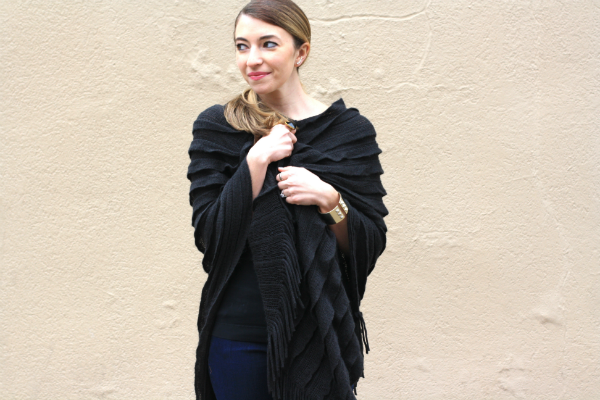 As you can see from above, I took the plunge and layered this beautiful Silk Flutter Necklace from Pop of Chic over an ultra cozy blanket poncho. By keeping the rest of the outfit simple, it creates the perfect canvas for an edgy look. 2- Minimize the use of additional jewelry. Let your necklace do the talking (no bold statement earrings). 3- Play around with different necklines (this is my ultimate favorite). Try wearing a chandelier necklace over a turtleneck. Get creative with your pairings! 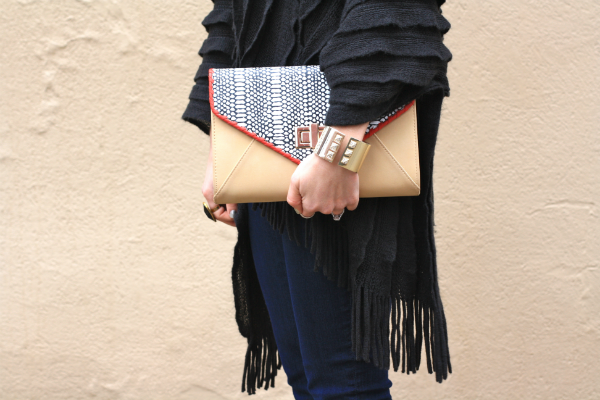 There's no reason why you shouldn't pile on the statement accessories along with your sweaters this season. Just think about how boring your outfit would be without it ;). Don't forget to give Pop of Chic a follow on Instagram, Facebook, and Twitter to view more of their chic pieces at chic prices. Faux fur is one of the most fun trends to rock during the winter. As much as I love a fabulous faux fur statement coat, the faux fur options do not stop there. From a warm fuzzy vest to plush hats and luxe collars, there's several ways you can update your outfit with a playful edge. I have a handful of vests in my closet in various shades that I rotate into my wardrobe each week. They make for an excellent layering piece for any outfit and act as a natural pair against denim. Recently, all of my weekends have been booked solid due to venue hunting (more details on this coming soon) and I need outfits that will keep me warm while touring the properties. For these occasions, I ditch the puffer coat and change up my outerwear. I never pass up the opportunity to take my moto jacket and turtleneck for a spin. Next time you are stepping out and planning to wear a faux fur combo, try pairing a moto jacket underneath and have the vest act as your outerwear. You'd be surprised at just how warm it will keep you! Side note, I'm really excited to start decorating our apartment with the sweet little gifts we've been getting from our friends and family. 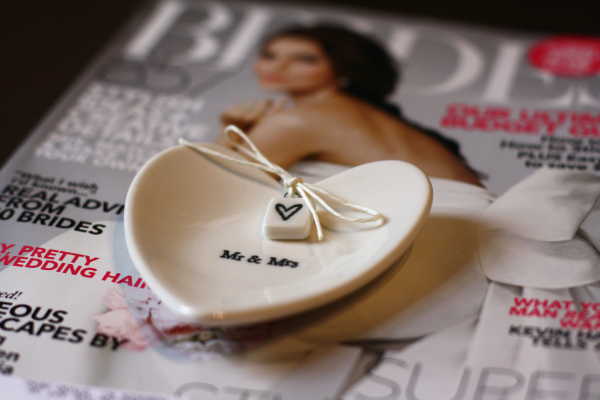 How cute is this Mr. and Mrs. jewelry tray my sister gave me? I can't stop smiling when I look at it. I still can't believe I'm engaged! It has been an honor to work alongside Artem Lomaz of NinetyThree Entertainment for the Dining With The DJ Series. I hope you enjoyed the beauty and style discussions in episodes 1 and 2. Below you will get a little more insight about why I enjoy styling and how I help others improve on their self-confidence. In the last episode I step slightly out of my comfort zone (in a good way), as Artem demonstrates how he helps his clients enjoy the moment and have some fun! It may involve singing + a restaurant full of people + a serious throwback song from my childhood. You'll just have to tune in to find out exactly what went down ;). Special shout-out to Dan Exter, Video Editor of the Dining With The DJ Series. Check out more of his work here. Far too often my weekends are spent doing all of the chores/errands that I simply do not have time for during the week. I always promise myself to get everything done ahead of time so I can enjoy the weekends at home. I guess that's something I need to work on. Somehow amidst all of the driving and running around, I managed to make a quick stop into the mall. I haven't shopped since before my birthday (early December) and it felt so good to browse all the new collections in stores. Here are three of the items that I currently want, need, or would love to have in my closet. What's on your list? To shop the items listed below, simply click on the photos and it will take you directly to the website. Shopping made easy! I had the pleasure of sitting down with Artem Lomaz, Event Host and Founder of NinetyThree Entertainment, to get the inside scoop on the wedding industry, along with some exclusive details on how he keeps his service professional, yet customized and personal. Artem is extremely thoughtful and creative. He takes pride in every event he hosts and he makes it his mission to cater to each individual's specific needs. I learned so much just by listening to him speak about the development of his business. His mantra, "You'll succeed because you care,"is inspirational and can be found relatable to all entrepreneurs. After tuning into Part One and Part Two below, you will see why the crowds at every event love him! He keeps the energy alive, and he definitely knows how to get over a hundred people on the dance floor. Before I introduce you to the #DiningWithTheDJ series, I want to give a very special shout-out to GBH Events who helped capture such a fun evening. GBH specializes in video and photography for a multitude of clients. I felt super comfortable with them in the room, it was as if they weren't even there! GBH did an excellent job at portraying the mood and atmosphere at Sabores. Which, if you haven't been to Sabores in Hoboken, you must stop in and taste their guacamole and chicken tacos. It's the perfect spot for an evening out with friends, or even a low key date night. Without further suspense, I introduce you to the first two episodes of #DiningWithTheDJ where I give my thoughts on professional dressing along with the popular male question, should the pocket square match my tie? No matter what season it is, I like to consider myself a hat lover. Any chance I get to add another edgy accessory to my outfit, I take it! Considering my commute to work consists of mostly walking, I need all the layers I can gather. Beanie hats are truly my saving grace this time of year. You'd be surprised at how much of a difference it can make to throw on a hat when the temps really dip. It acts like a personal space heater. Currently, I'm a big fan of the knit helmet (a glorified version of the oversized beanie). They are super fun and make a big statement. 1- Beanie and the braid. 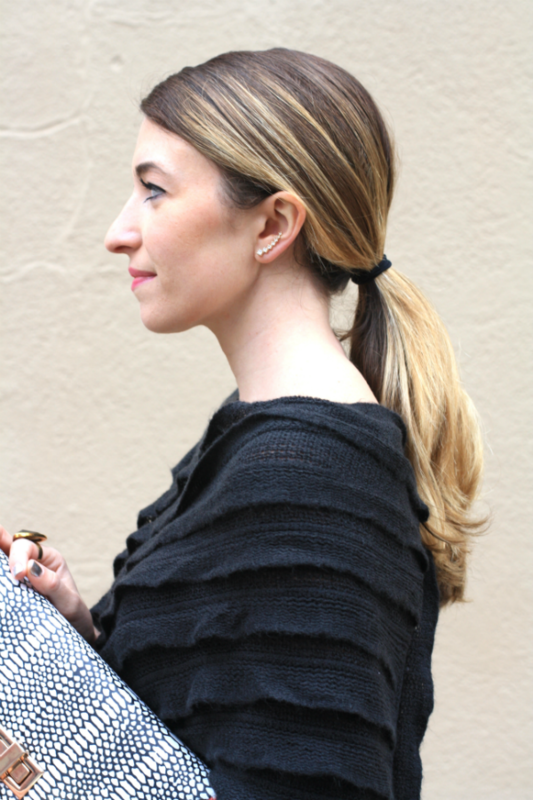 This is the perfect hairstyle to to avoid the dreaded hat hair. 2- Loose Waves. 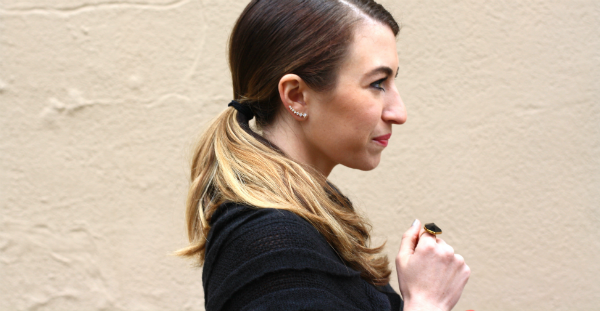 This is a super casual look the can be easily worn on any hair length. You can show off your waves by slightly pushing your beanie back. 3-The hair tuck. If you are seeking an ultra-sleek look for running your weekend errands, try tucking in your hair completely. It's also an excellent way to combat a bad hair day! 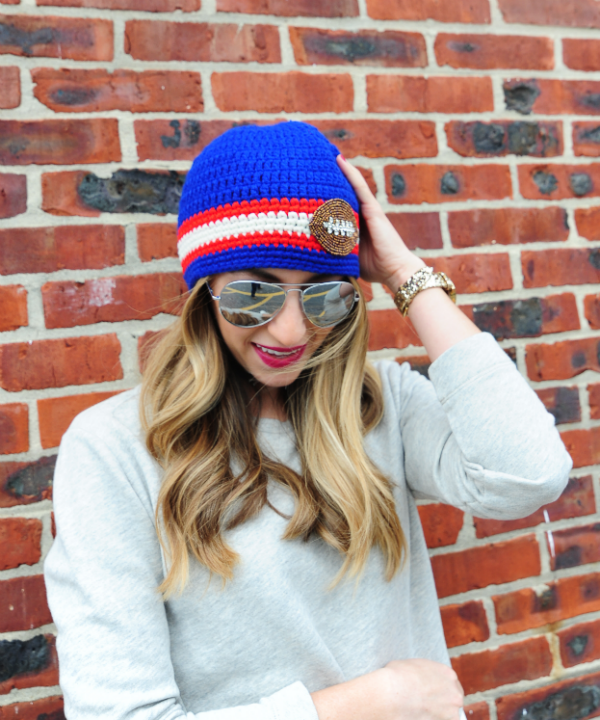 I'm a big fan of wearing my beanie with loose waves and finished off with a fresh pair of mirrored aviators. The look is so fresh for winter. 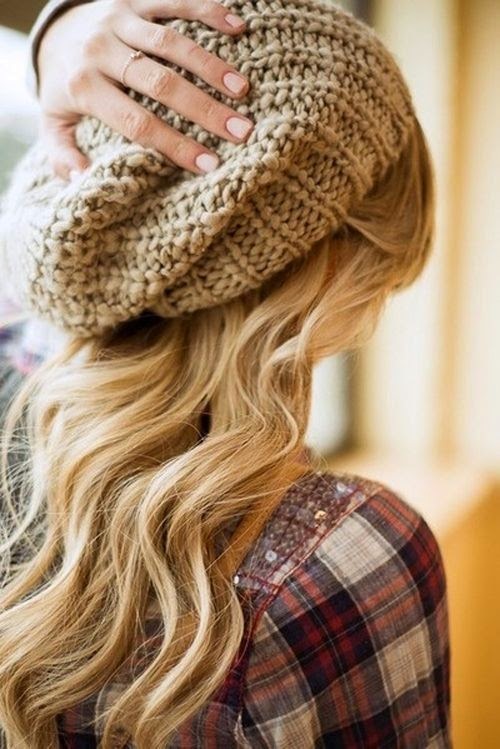 What's your favorite way to wear your beanie? What's more cozy and chic than an oversized cashmere sweater? The poncho, of course! 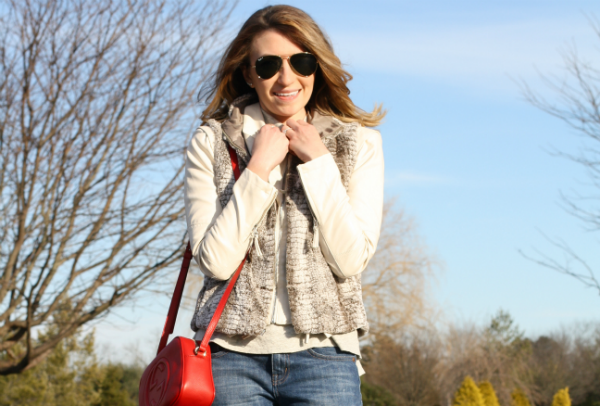 During the winter months, it gets tough to create a unique outfit that feels warm and fun. There's only so many days in a week that you can get away with the traditional sweater + statement accessory combo (I am super guilty of this). 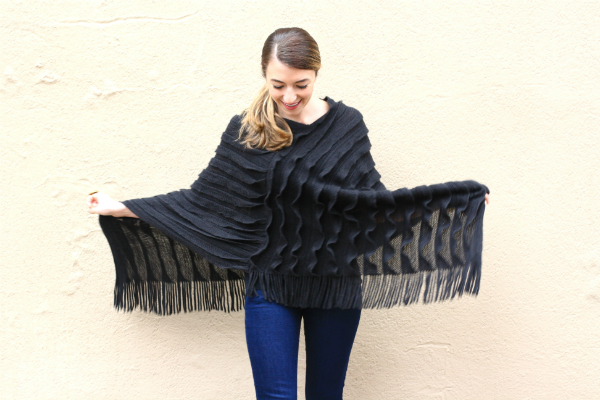 For a trendier alternative, why not try wearing a sweater poncho? 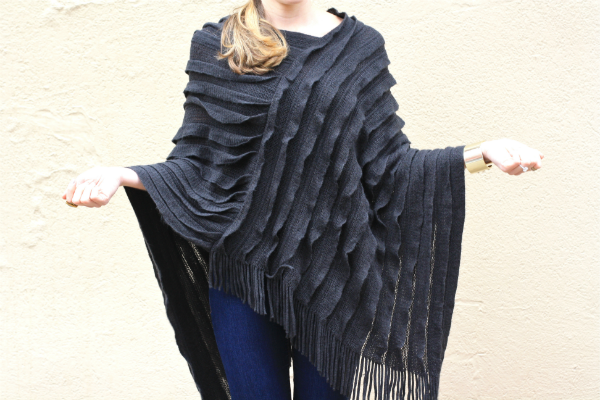 I love the simple design and modern details on this Black Poncho from Pink Slate Boutique. It comes in two colors- black and grey. 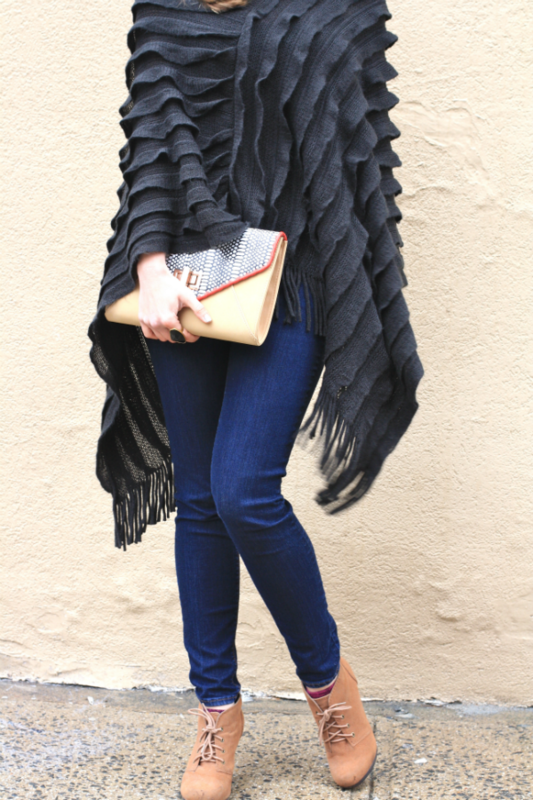 I adore the fringey and ruffle detailing throughout. It keeps the outfit exceptionally interesting! Size matters. 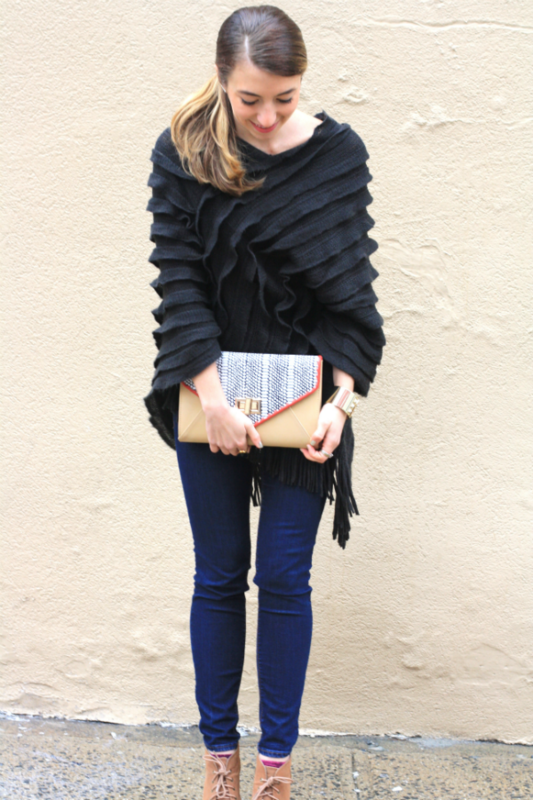 Oversized ponchos are everything this winter, but make sure it's not too big. You don't want to look like you're draped in a carpet :). Balance. To keep your outfit looking slim, be sure to pair with skinny jeans or leggings. If you're brave enough and the temps allow, try wearing with thigh-high boots for an ultra sleek look. Belt it. If you are looking to create more dimensional outfit pair with a printed or texturized belt. Versatility. 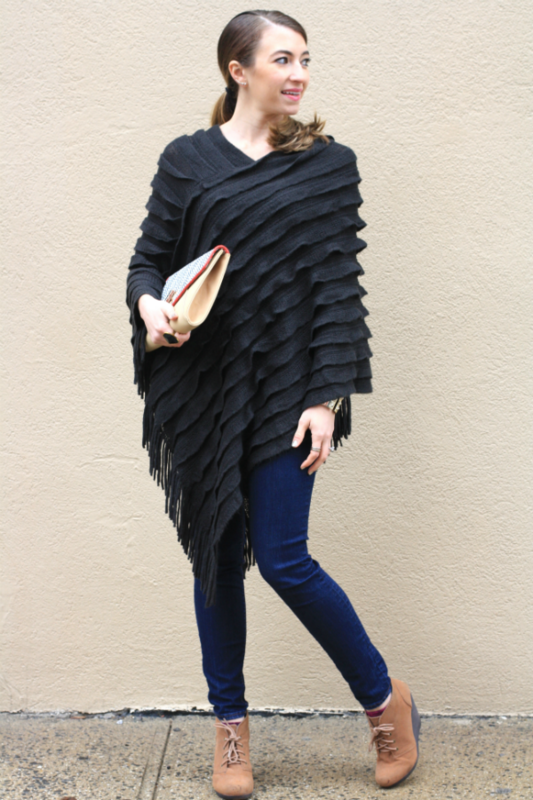 Search for a poncho with a round or relaxed neckline, like the one pictured above. This will allow you to create multiple looks with one garment. 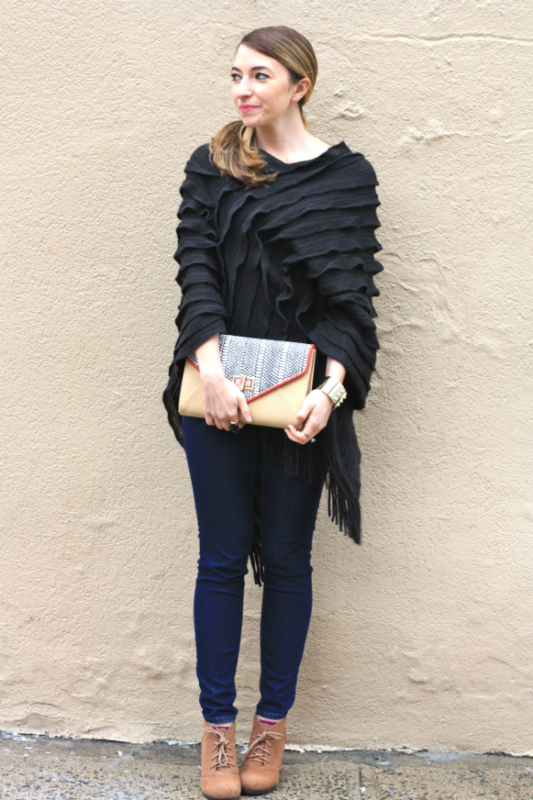 You can wear it slightly off the shoulder, diagonal across the body, or as a traditional poncho (seen above). So what do you think? 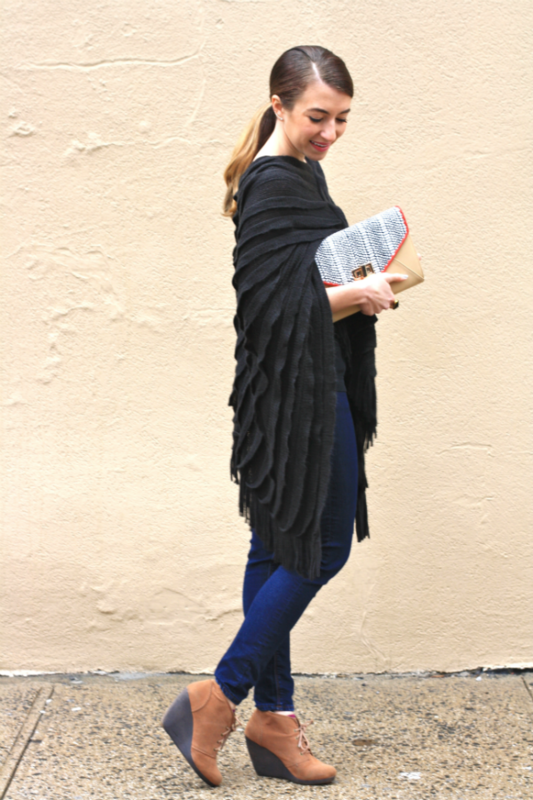 Will you fall in love with the poncho trend this season? How would you wear it?